To get started making your chicken you will need to draw and cut out its feet, beak, wings, tail and comb (that’s the red thing on top of a chickens head). I used an old cereal box for this. You can make your chickens look any way you want, maybe with huge feet or tiny wings. Have fun! 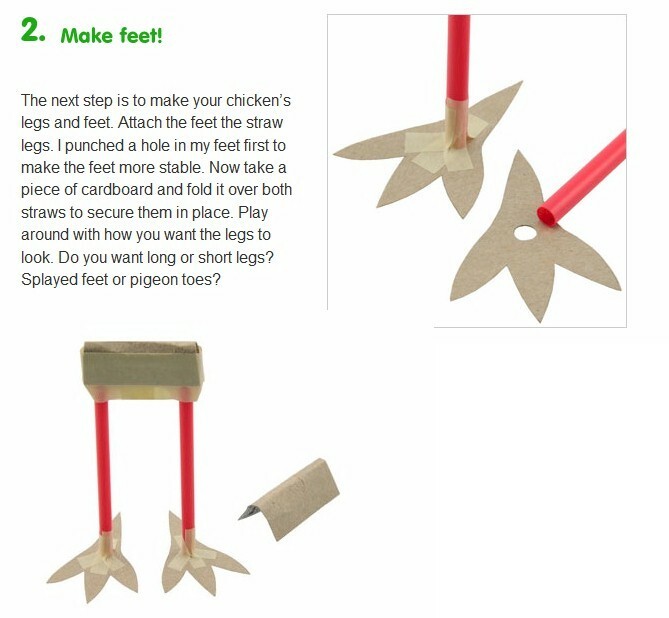 The next step is to make your chicken’s legs and feet. Attach the feet the straw legs. I punched a hole in my feet first to make the feet more stable. Now take a piece of cardboard and fold it over both straws to secure them in place. Play around with how you want the legs to look. Do you want long or short legs? Splayed feet or pigeon toes? 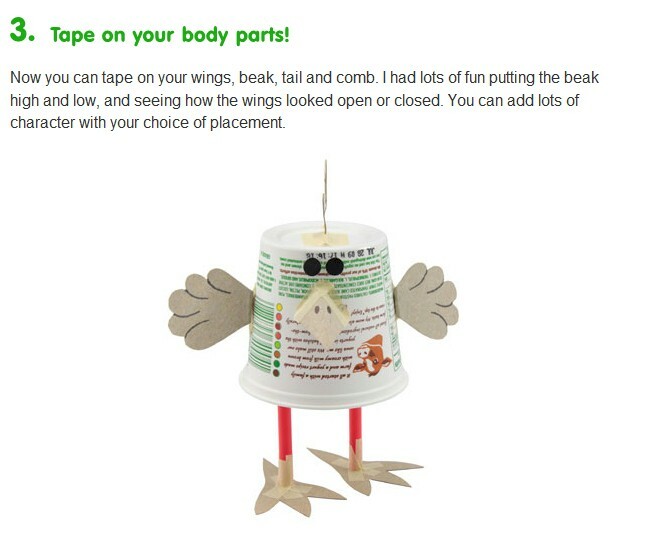 Now you can tape on your wings, beak, tail and comb. I had lots of fun putting the beak high and low, and seeing how the wings looked open or closed. You can add lots of character with your choice of placement. The final step is the eyes! These are the most important part of the chicken! You can really do all kinds of fun things with the eyes. We have tried big eyes, little eyes, googly eyes, and crazy eyes. Just cut out the shapes you want and go wild! 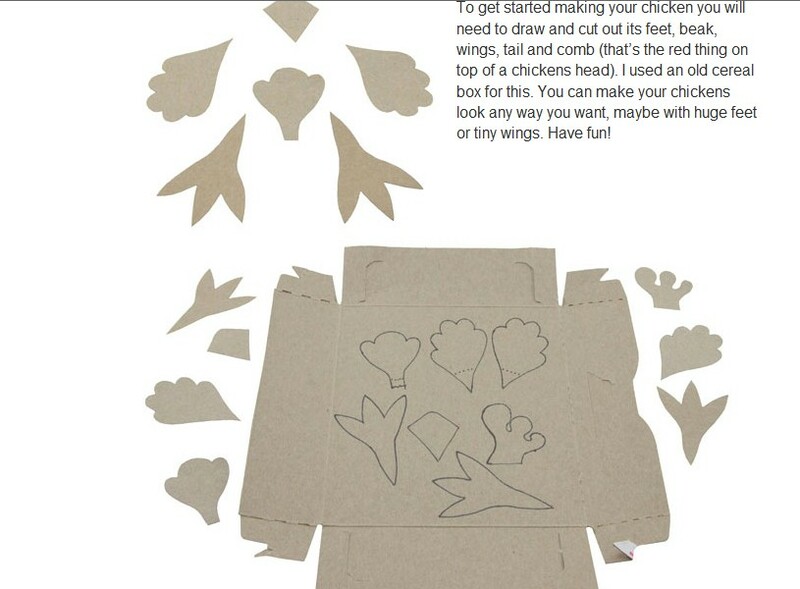 The simple chicken is fun and very easy!, From here you could paint or color your chicken any way you want and be finished. This craft is reprinted courtesy of LooLeDo.com. LooLeDo.com | Fun Kids Crafts, Science Projects and More. Step-by-step instructions for hundreds of incredibly cool crafts and science projects that can be built from everyday household objects.